so GW are really cranking up the excitometer on us all, and in the last couple of days we've seen reveals of unit and weapon profiles. Here's a few of my thoughts on what we've seen. Greetings all, time for a mind wipe I think, let's ctrl-alt-delete my brain! Don't worry though, I'm not about to ditch the blog and start a new one (hmm, tempting, but quite a lot of effort methinks!). 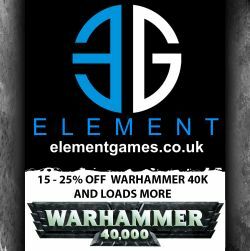 That being said, with the announcement from GW that we will definitely be seeing 8th edition this year (and hopefully rather sooner than that deadline may imply) I think it's the perfect time to take a quick look at what I'm doing on the blog and decide how I want to evolve it in the future. Greetings all! So, having already posted one article this evening, here's number two of the day for your delectation, though this one is very different subject matter. Earlier today the warhammer community team conducted a live interview on their facebook page between the head of the community team and the team leader for the re-writing of the rulebook. I watched it afterwards (huh, who'd have kids eh) and have made notes of everything they discussed. That information is below, along with my own thoughts on what they said (and equally as important, what they didn't say). Greetings all - welcome once more to the inner workings of my hobby station. This week I've mainly been working on commission projects, hoping to finish my current workload so that I can concentrate on the Dusk Knights prior to my doubles tournament in June. Greetings all! Well, this really is the New Games Workshop (TM) isn't it! Not only are they telling us that a new edition is coming and that codices will soo be off sale, but they're already answering anticipated questions! Well, I guess therefore it's time for me to have a quick look at what we can glean from the FAQ released this afternoon. 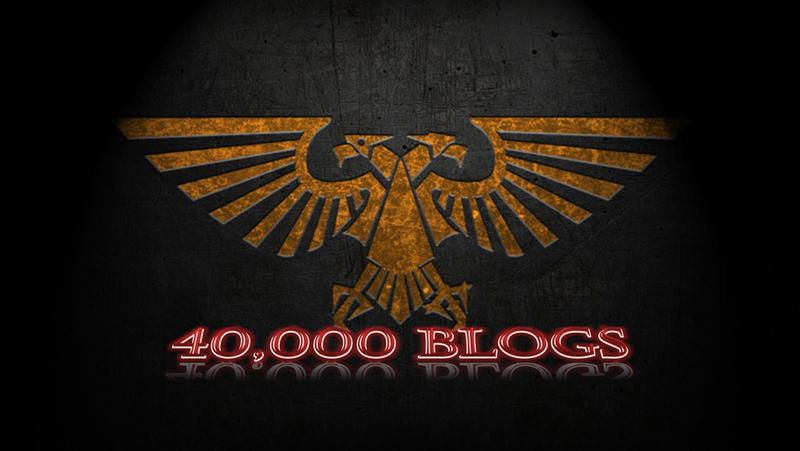 Greetings all, I'm sure I'm telling you nothing by advertising this blog for you all, it's one of the Gloriana class blogs out there for anyone interested in 40k. March calmed down a little bit for me in the posting stakes, though I still managed 18 posts in the month. The reduction was mainly down to my busy last week however, so a blip it most certainly was and I'm not worried that I've burnt myself out with my posting schedule. The regular features are continuing, and I've got a little idea formulating in my head for a new series coming up too. I dipped just a little bit below my 18,000 average target this month, but that's ok since I smashed it by so much last time. It's also not surprising that the viewing figures dropped a little since I had a quiet week of publishing nothing. I finally did it! Just over four years I think it took, but my earnings from Google finally tipped over the magic £60 mark. Now I need to just wait for Google to actually cough up the money! I have my eye on something to spend the cash on too, hopefully you'll all agree it'll be worth it. Golovin 3 saw some decent exposure - Golovin 4 will see us boosting our armies up to 1500pts, and hopefully will feature my new city board terrain too! Unfortunately, most of the stuff I've been painting this month has remained unfinished up to this point, though I have delivered the first batch of Screamers and picked up a big pile of flesh hounds to work on. I hope you all like red! March was successful as I only bought paints, and though I'm teetering very much on the edge of buying some more figures this month, they'll be for something other than 40k, so that would still technically be a pass. I picked up another commission in March, and though I haven't managed to complete quite as much as I'd hoped this month, things are coming along nicely for a bulk completion! Just crept over the finishing line on this one, though hopefully things will pick up again next month. I have enough models to get cracking on this now . I've already tried out a new test scheme that should work well on both the genestealer cult models and the guard stuff I want to accompany them. Well the majority of the Tau have been sold, so it only remains to figure out the new paintscheme and get cracking on the bits I have left eh? Ive now had a couple of attempts with an airbrush, the second being much more successful than the first. I think it will almost certainly always be a tool for undercoating to me given the final appearance of models using an airbrush for their finish, a lot of the really smooth blends just don't quite sit right with me in the grim dark far future..
Erm, yeah, I lost March's narrative game to Ryan too, I'm way behind now, so need to get cracking on racking up a winning streak! March was a good month for the boys in blue, winning 3 games in exchange for just a single loss. I'm going to delete this one off the list now since the Tau have been sold and won't be back for a while. Haven't been to a tournament yet this year, though I have now bought a ticket for the Greetings from the Warp doubles event in June. The Dusk Knights will be pairing up with the Deathwatch for this event, and our first practice (using 750 per person against a 1500 list) saw an admittedly non competitive guard list tabled on turn 3 (effectively tabled by T2, it was just a case of taking out 3 guard infantry and a wounded chimera). Greetings all, welcome to my usual weekly glimpse into the depths of the hobby from my perspective. Not too much painting progress this week, but there are a couple of significant bits of news to bring to you! Greetings all, welcome to my road to competence series once more, and I'm now starting to get a good group of games under my belt, getting much more confident about the units I'm bringing to games. I'm pretty settled on a 1500pt 'standard' list now, so at that point we of course decided to mess things up completely by playing a 1250pt game of Capture the Squig. After that, I went back to my 1500pt list to take on my old faves, the Dark Eldar. Well I hope you noticed I went away for just over a week, if not then my blog isn't quite as interesting as I thought it was! I've not been ill, or away on a holiday or anything like that, just very busy - my eldest daughter was 4 last week so the week was spent visiting various relatives and friends to gather in an even larger collection of dolls, clothes and toys than she already has (seriously, how many dolls does a 4 year old need? Turns out it's a bit like plastic crack, there's always more to buy! ).